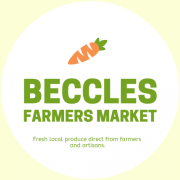 WHAT’S ON AT THE MARKET – Sat 17th July. We’re looking forward to getting our hands on delicious freshly picked local STRAWBERRIES from the Morton’s who are returning alongside our newest producers The Suffolk Goat Cheese Company and the textile artist Margaret Bacon. The Calf at Foot Dairy will be attending with their Raw Milk and Suffolk Smokehouse will be back with a range of smoked delights, as well as Barky Bites with her homemade pet treats. Oh!…. and the beautiful owls will be back (which you can hold for a small fee) with Fritton Owl Sanctuary. Psssst… This is the last market you can purchase fresh local asparagus – don’t miss out!! Congratulations to the winner of the last Raffle – Ticket No. 636! She won all these fresh market goodies with a 50p ticket —> Get your own tickets THIS SATURDAY at the Market to be in with a chance of winning!! Meet our ‘Producer of the Market’… Blackbird Cottage! Blackbird cottage have been attending our market since October last year. After becoming frustrated with a lack of quality Terrines available in the area they decided to start making their own – and they are truly delicious! They’ve just launched an Exclusive Black Truffle Chicken Liver Parfait and to celebrate being producer of the month we’ll be displaying some information on how terrines are made on their behalf with plenty of tasters available for you to try them for yourselves! See you at the Old heliport, Ellough from 9am – 1pm this Saturday.